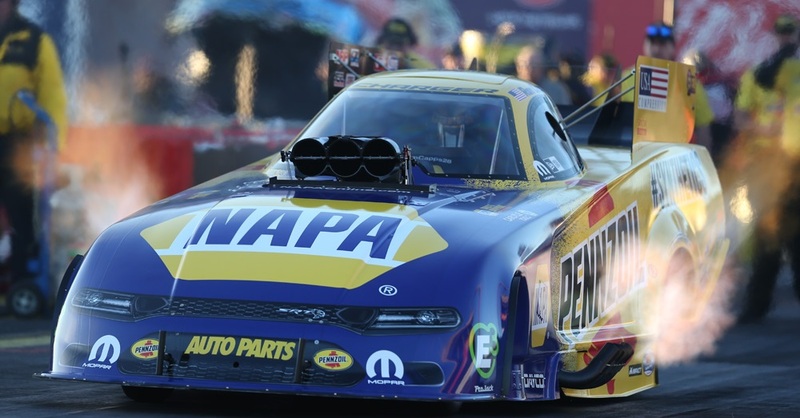 POMONA, Calif. (Nov. 12, 2016) – Ron Capps and the NAPA AUTO PARTS Dodge Charger R/T Funny Car team led by crew chief Rahn Tobler delivered the 16th NHRA world championship and $500,000 bonus to Don Schumacher Racing at the end of qualifying Saturday evening in the NHRA Finals at Pomona, Calif. 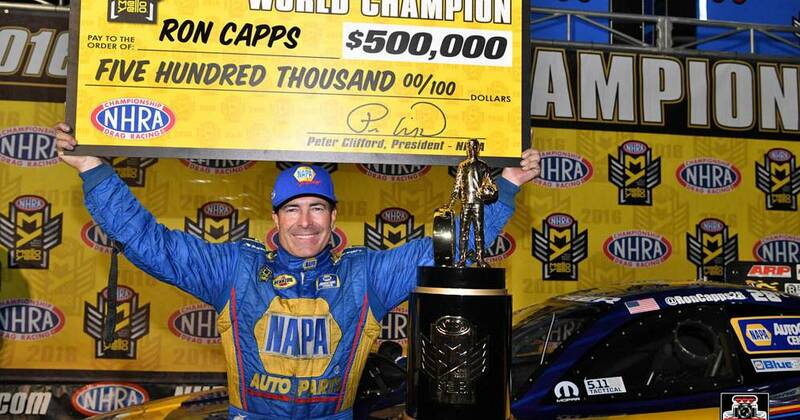 It is Capps’ first NHRA Mello Yello Drag Racing Series world championship after being runner-up a record four times. He will start Sunday’s eliminations with leads of 92 and 112 points, respectively, over DSR teammates Matt Hagan and Tommy Johnson Jr. The most a driver can earn Sunday is 80. 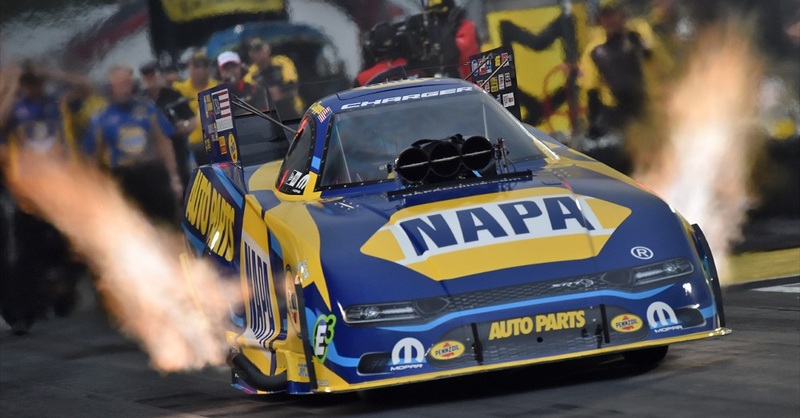 “I really haven’t slept well since the Countdown started after Labor Day,” said Capps, who lost a lead of 202 points when he won the regular season title after 18 races and points were reset to start the six-race Countdown to the Championship playoff when points were reset for the 10 championship contenders. “It really came together, but man, what a fight. My stomach has been in a knot since Indy. I’m not sure I’ll sleep tonight. It hasn’t sunk in. I have to tell you that the trophy should be broken into a trillion pieces and given to all our fans. We have the best fans. “I’ve been afraid to do anything all week. I was like bubble wrapped – I didn’t want to hurt myself. I didn’t want to start a speech. I was afraid to jinx anything. For Tobler, it is his fourth world championship as crew chief and first with DSR; he won two with Shirley Muldowney in Top Fuel and one with Cruz Pedregon in Funny Car. “I can’t even tell you how focused Rahn Tobler has been this year,” said Capps, who was the series runner-up in 1998, 2000, 2005 and 2012. “I almost gave up trying so hard and wishing so hard, and just focused on winning races. With everything we got this year – my 50th career win, passing some people I really looked up to in the sport with wins – that’s mind-boggling for me. 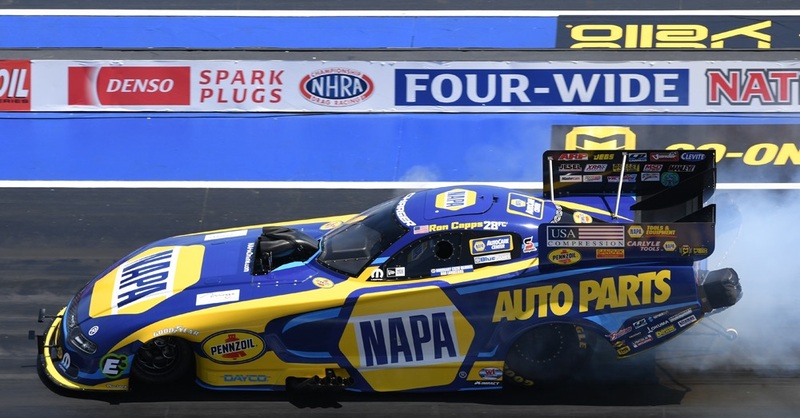 Capps’ championship comes two weeks after teammate Antron Brown and the Matco Tools/U.S. Army team clinched its second straight and third Top Fuel championship in five years. 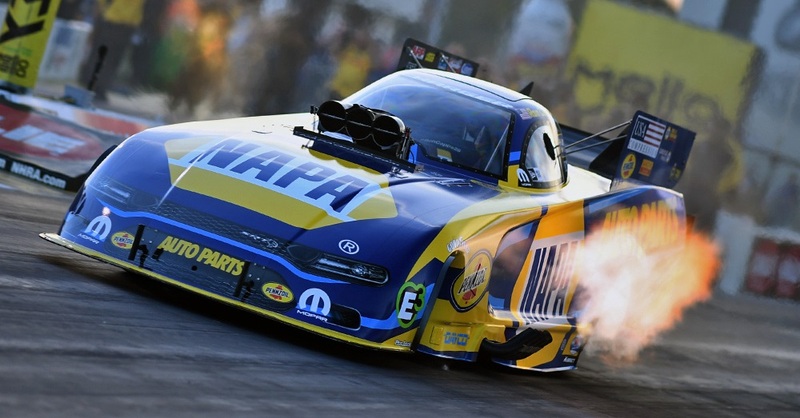 This is the fourth time since 2005 that DSR has won both nitro world championships: Brown and Capps this year, Tony Schumacher and Matt Hagan in 2014, Brown and Jack Beckman in 2012 and Schumacher and Gary Scelzi in 2005.